Rolf Kühn's talent is simply boundless, and the music he creates with his young bandmates Johannes Fink, Ronny Graupe, and Christian Lilinger is contemporary in the truest sense of the word. Born of the moment, their sound is comprised of hypermodern big city sounds, warm tones and energetic outbreaks, as they converse with one another. It is astounding to hear all the musical possiblities spring to life, richly varied, new sounds, that weave together rythym with polished, essentially pure voices. Jazzfestival Bonn 2013: Kühn's familiar style was on display. Short, bold, agressive driving jabs. A Front Man giving all his clarinet has to offer. Tri-O is made up of the outstanding guitarist Ronny Graupe, who breathtakingly responds to each of Kühn's calls. The virtuoso multiinstrumentalist Johannes Fink, and Christian Lillinger; a whirlwind young savage on drums. A strong opener to the Jazzfest Bonn. Songs like "Lion's Speech", "On Tauris" or "Rolf's Speech", eschew tenderness, and present themselves in unforgivingly dense, tricky arrangements. Expressionist and edgy, provocative and relentlessy restless. Precisely therein lies voltage and morevover, an unbridled power. It is seldom that one expereiences a contemporary jazz ensemble that cooks with such, nearly explosive, energy. In good Bach polyphonic style, the equally talented instrumentalists squared off. Generating complex four-part pieces, they pushed the boundaries of tone, ordinary rhythm, and harmony. Sounds both boisterous, and whispered, with moments that approached ecstasy. Christian Lillinger's drum sticks actually achieved lift off, flying through the air, and Johannes Fink came close to ripping the strings out of his bass. Crazy! No wonder that the audience went wild. 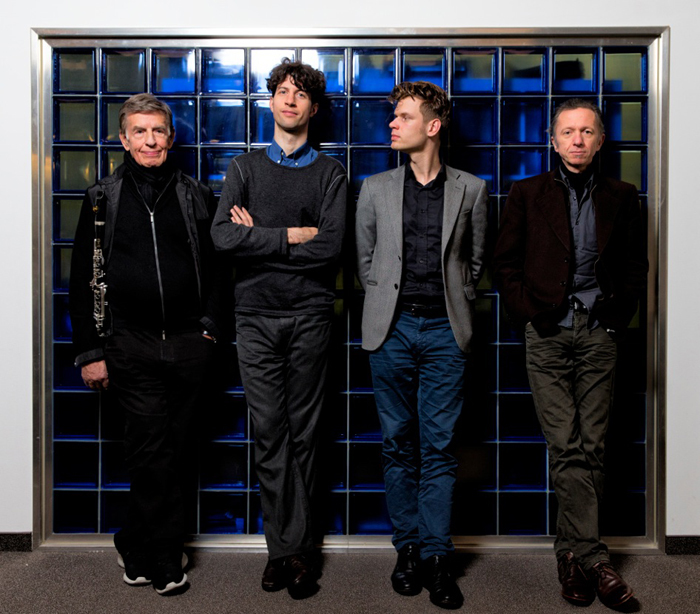 With Ronny Graupe on guitar, Johannes Fink on bass and Christian Lillinger on drums Rolf Kühn has assembled a band that plays vital, complex, flamboyant and exciting jazz, as it is rarely heard. This music is unpredictable. At once elegant, and humorous. Layed back, then at turns unbridled and hard driven. The French bass clarinetist Louis Sclavis sat in. Smoothly infiltrating a seemingly inpenetrable ensemble. No small feat. Kuhn's sound is still full of warmth and radiates throughout the room. Nary a wavering or unstable, tone is to be heard. Only his splendidly ripe sound. Quite simply a Jazz EVENT! The music sounds so fresh and full of musical wonder, as if a child discovers a new world and watches it full of perplexity and admiration. Berlin-New York-Festival in Brooklyn: Rolf Kühn & TRI-O forged a path blending '50s cool jazz with contemporary sounds … (they) confirmed that the facility for creating worthwile jazz is still fully functioning. A few years ago Kühn founded, for the first time in decades a band, with young musicians from Berlin. A standing group with which he now gave a brilliant performance at Porgy & Bess. Rarely have juvenile subversion and saged wisdom come so happily together in jazz. A true gem of improvisational music, combining curiosity, experience, accumen, intergenerational symbiosis and, the magic that is intuitive spontaneity. ENJOY JAZZ: Perhaps the biggest surprise on the bill was provided by well-known, 81 year old, Rolf Kühn, who surrounded himself with the incredibly good young Berlin companion band Tri-O.These four musicians are the most exciting thing to be seen or heard in recent years on the German stage. Johannes Fink on bass, Ronny Graupe on guitar, and Christian Lillinger on drums are grounded in outstanding craftsmanship and constantly alter their unconventional sound at any given moment, with well placed pressurised blasts. Lillinger forged ahead with his filigre, polyrhythmic based, sound aesthetic, reminiscent of a punk drummer's brute force, punching new creative holes into which the ensemble happily followed with a thirst for discovery, that was rewarded with an evening completely free of cliché.The audience of enthralled afficianados couldn't get enough of it all. What Kühn conjured up was the height of technical viability, paired with sublime freedom of expression.This concert was nothing short of transcendental. Jazz Baltica 2011: Another great musical highpoint was reached this year. The Rolf Kühn Tri-O is an outstanding example of Jazz renewing itself. This 81-year old Grand Duke of the jazz clarinet, that even Benny Goodman couldn't resist, is a consummate artist who with his band, unites the generations by weaving musical stories that go straight to the heart. Jazz Baltica 2011: Formidable appearance! Jazz Baltica 2011: Refreshingly bouyant music; complex, masterful compositions. This was an impressive musical collaboration. Wild solos on each of the four instruments, and sensitive interplay alternated in rapid succession. An evening of Jazz not soon to be forgotten. "Close up" lives from an arresting contrast between clear groove conformity, and the spirited pulverization of it. This is never contrived, it simply takes place, in a careful, respectful manner. Even so, throughout the tone is arched led by Kühn's clearly contured,warm clarinet. Rolf Kühn and Tri-O at the Anniversary of the Darmstadt Jazzinstitut : A compelling exchange of ideas that equally reflects the history of jazz music, and the contemporary. Christian Lillinger is a hyperactive drummer with an unorthodox, highly dynamic technique, Ronny Graupe's style resembles Thelonius Monk's guitar in it's yearning to unite tones and chords that do not appear together in nature. Finally there's Johannes Fink who, like Ron Carter, plays with the precison of a Swiss clock, combined with the singing tone of an Oscar Pettiford, and the rumble of Charles Mingus. Rolf Kühn has joined together with three very young Berlin musicians, widely considered to be the spearhead of contemporary jazz in Germany. Ronny Graupe, Johannes Fink and Christian Lillinger could be Kühn's sons, perhaps even his grandchildren. However he meets them at eye level, and precisely that is what makes this union delightfully provocative. Illustrious Finale Concert: What Rolf Kühn and TRI-O offered was Jazz, authentic and joyous. Adroit and refreshing. Rousing interaction and thrilling improvisation marked the evening. Johannes Fink harnesses his bass to a transportive narrative power, and Christian Lillinger brings forth eruptions from his drums. European Jazz Jamboree: Kühn's soulful playing effortlessly spurs the youngsters Ronny Graupe, Johannes Fink and Christian Lillinger on. His pieces are as complex, as they are varied and uncoventional. In interaction with the grand TRI-O, this saged master proves to be distilled and confident, and always riveting. Rollercoaster: A series of tunes that blend wafting abstraction, tough forward momentum, and lilting themes that cater to the playfulness of the band. Very fine stuff. Rolf Kühn founded in 2008, for the first time in some 40 years, a band with musicians from the free improvisation scene in Berlin. Eyes closed, they go spelunking through narrow corridors of brittle masonry and and glass shards. Deeper and deeper into sound caverns where composition and self expression mesh. The four musicians build a refined, dazzling quartet, which entises the more concise in style boper Ornette Coleman on. The challenge opens them all up to improvisation thats risky and complex in its internal structure as it spins forward. In "Rollercoaster", the distinguished master takes a ride with young musicians from Berlin ... The result sounds like swinging hot new chamber music. What fun! How daringly robust and imaginative when Rolf Kühn faces off with this youthful trio, comprised of some of the best musicians in Berlin, and approaches them as contemporaries. It is indicative of Rolf Kühn, who has so often collaborated with other great jazz musicians, that he most recently created an alliance with significantly younger musicians from Berlin, and thereby instantly reaffirms his status as a Jazz musician for The Ages.